The first five observations seem to be close to each other, and the last five observations seem to be close to each other. Observation 6 is separated from the first five observations with a (Euclidean) distance of 2.5, and the same distance separates observation 7 from the last five observations. Observations 6 and 7 differ by 1.5. 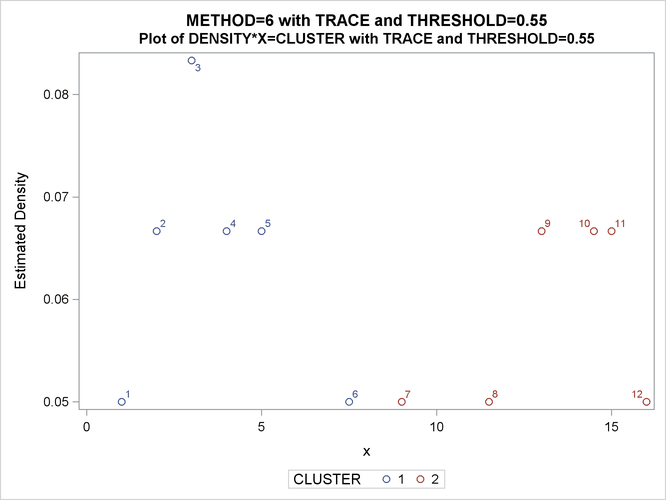 Suppose METHOD=6 with a radius of 2.5 is chosen for the cluster analysis. You can specify the TRACE option to understand how each observation is assigned. Note that in Output 78.5.1, observation 7 is originally a seed (indicated by a value of –1 in the "Old" column) and then assigned to cluster 1. 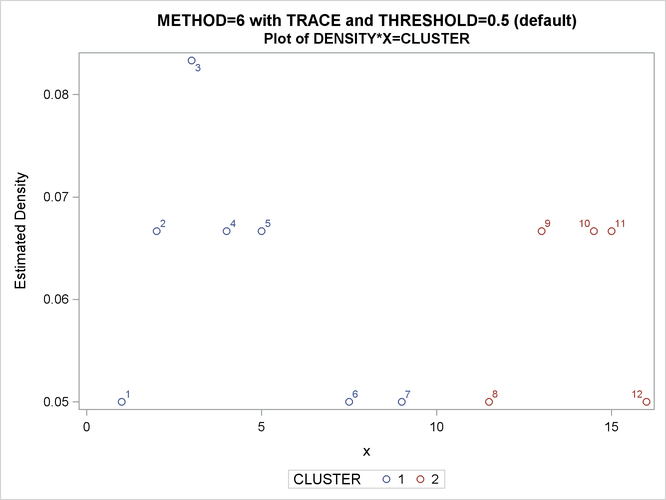 This is because the ratio of observation 7 to cluster 1 is 0.5 and is not less than the default value of the THRESHOLD= option (0.5). If the value of the THRESHOLD= option is increased to 0.55, observation 7 should be excluded from cluster 1 and the cluster membership of observation 7 is changed.